Acknowledged author Ulric J. Gelinas wrote Accounting Information Systems comprising 744 pages back in 2017. Textbook and etextbook are published under ISBN 1337552127 and 9781337552127. 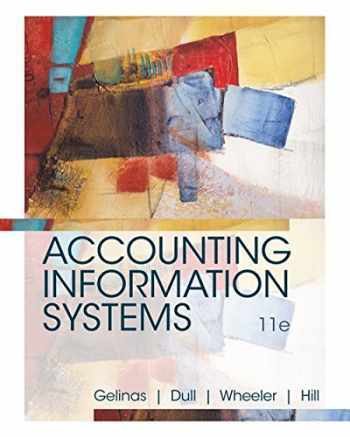 Since then Accounting Information Systems textbook received total rating of 4 stars and was available to sell back to BooksRun online for the top buyback price of $61.68 or rent at the marketplace. As an accounting professional, you are expected to help organizations identify enterprise risks and provide quality assurance for the company's information systems. You can rely on ACCOUNTING INFORMATION SYSTEMS, 11E's clear presentation to help you understand the two issues most critical to accounting information systems in use today: enterprise systems and controls for maintaining those systems. ACCOUNTING INFORMATION SYSTEMS, 11E explores today's most intriguing accounting information systems (AIS) topics and details how these issues relate to business processes, information technology, strategic management, security, and internal controls. The authors focus on today's most important advancements, using a conversational tone rather than complex technical language to ensure you develop the solid foundation in AIS that you need to be successful.